While Knock Out roses are hardier than most roses on the market--to USDA zone 5--the shrubs still require protection from freezing temperatures and wind. They should be cleaned and groomed before winter, and any Knock Outs grown in climates colder than zone 7 should also be wrapped. Begin winterizing your Knock Outs in the fall before the first hard frost, then wrap them in burlap until the last hard frost in spring has passed. 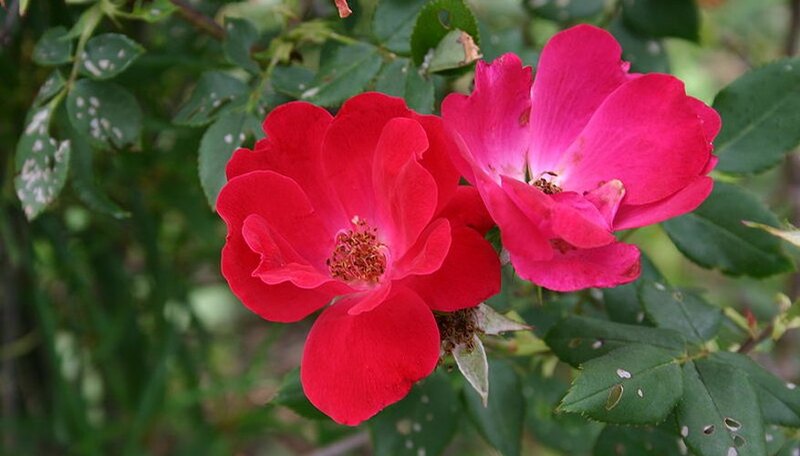 Inspect your Knock Out roses in the fall before the first hard frost. Look for damage or disease, and for any foliage or plant remains on the soil. Cut away any damaged or diseased canes with your secateurs and remove any remaining foliage still on the shrub. Clean up the soil under the plant, picking up every decaying leaf or weed shoot. Water your Knock Out roses deeply before the first frost to fortify the soil and the roots against the drought conditions of winter. Create a collar around the base of the shrub with folded newspapers stapled together or with lengths of flexible garden edging. Fill the moat with compost, fresh potting soil or leaf mold up to 3 inches above the bud union. This will protect the critical part of the plant from cold temperatures as well as from drying winds. Wrap the roses in at least two layers of burlap, leaving some excess fabric on the top to tie off. Wrap the shrub snugly but not so tightly that the canes are strained. Tie the top and the bottom of the burlap so that the shrub looks like a wrapped piece of candy. Unfurl the burlap in the early spring after the last hard frost. Remove the collar and brush the compost or other material down on the soil around the roots. Prune the shrub to 12 to 18 inches tall to encourage vigorous growth. Water it well after pruning to reduce shock and follow up in two to three weeks with the first seasonal application of rose tone or fertilizer.